Tatenda Taibu's second century of the match kept Zimbabwe XI alive in their four-day game against Afghanistan in Mutare. Zimbabwe, trailing by 77 on the first innings, had slipped to 102 for 5 before Taibu and Forster Mutizwa hauled the home side to a degree of safety. Taibu, serving a ten-match ban from the national side, and Mutizwa put on 165 before Taibu's dismissal signalled the close of play. There were 19 boundaries in Taibu's 195-ball effort while Mutizwa was more patient, taking 129 deliveries to reach 56. They were helped by some indisciplined bowling from Afghanistan, who overstepped on 18 occasions in the innings. Afghanistan got a hefty first-innings lead despite resuming the day only seven runs ahead with three wickets in hand due to a century from No. 7 Mohammad Nabi. He completely dominated a 70-run eighth-wicket stand with Dawlat Ahmadzai, who contributed only six runs. 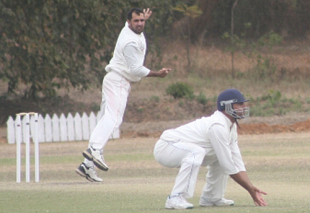 Nabi stroked 13 fours and two sixes before falling to offspinner Timycen Maruma, who finished with six wickets. Afghanistan's innings folded within an over of Nabi's dismissal, with no runs added to the total.